In fall or spring, mums are a favorite early or late season flower, and while there's nothing like the real deal, the embroidered version makes for beautiful hoop art. This free chrysanthemum embroidery pattern is easy to work and it's also adaptable if you want to add it to other floral designs. The entire design uses only two stitches, which makes it a quick project and perfect for beginners. The simplicity makes it good for those who are new to embroidery, but that's also what gives it its modern appeal. These mums fit nicely in an oval embroidery hoop, making beautiful seasonal wall art. They work well on a pillow or on the bottom edge of a tea towel. If you'd like to wear your embroidery, use one of the chrysanthemums on its own and make it into a pin or patch! Download the JPG file for the chrysanthemum pattern and print it out. You can adjust the size however you'd like, but if you're using a 5 x 9-inch oval hoop, you'll want to keep the width to about 7 inches. Use your favorite transfer method to mark the flowers on your fabric. If you'd like, at this point you can even rearrange the flowers to make a different design. For example, you might consider transferring many flowers to fill an entire embroidery hoop, rather than leaving it as three mums in a row. The sample embroidery uses three strands of embroidery floss throughout the entire project. You can choose to work with any number of strands you'd like. Perle cotton embroidery thread would also work well. 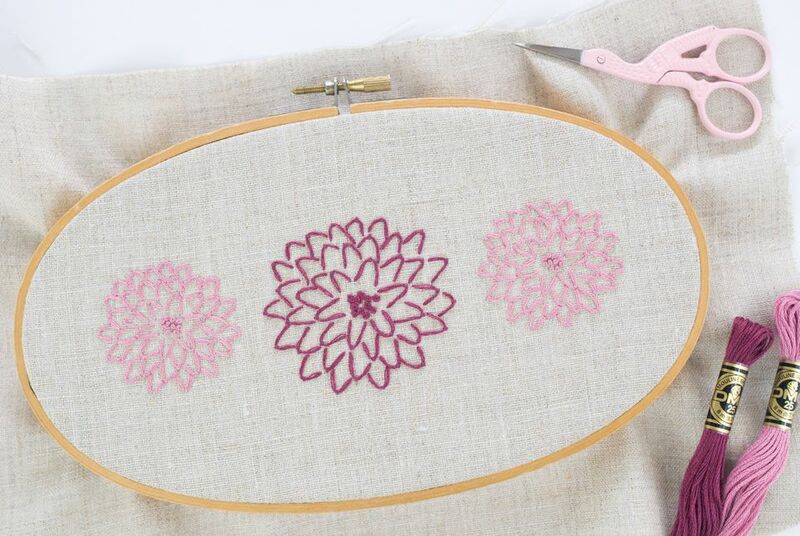 Use french knots to form the center of the chrysanthemums. If you don't like working french knots or if you haven't learned them yet, try substituting a cluster of small straight stitches instead. This part of most mums is the same color as the rest of the flower, but you can choose another shade of whatever color you're using, or even a yellow or light orange. Form each petal with a fly stitch. There are several ways to work this stitch, but for the flowers it's best to keep the first half of the stitch loose enough that it makes a curve instead of an angled V. Tack it down with a tiny stitch, like you would on a detached chain stitch. Some of the petals are uneven, with one side longer than the other. That's okay! Fly stitch still works for these, so just make the taking stitch at the apex of the curve. As with the centers of the flowers, you don't have to work the entire flower in the same color. Gradient threads would look beautiful for them. You could even use several shades of the same or similar colors, changing them out with each round of petals. Finish off your project however you like, depending on how you'll use the finished embroidery. Make Embroidered Pins and Patches With These Free Mini Patterns!